Only known image of SCP-4207 with SCP-4207-1 instances. Image taken from subject's phone before electromagnetic interference. Special Containment Procedures: A perimeter has been set up around the electromagnetic radius of SCP-4207 and is constantly monitored by surveillance systems. Five agents are stationed and patrol the perimeter to prevent civilians from breaching the exclusion zone of SCP-4207. SCP-4207 is to be checked thrice a week for any animals or individuals that may be under its effect. 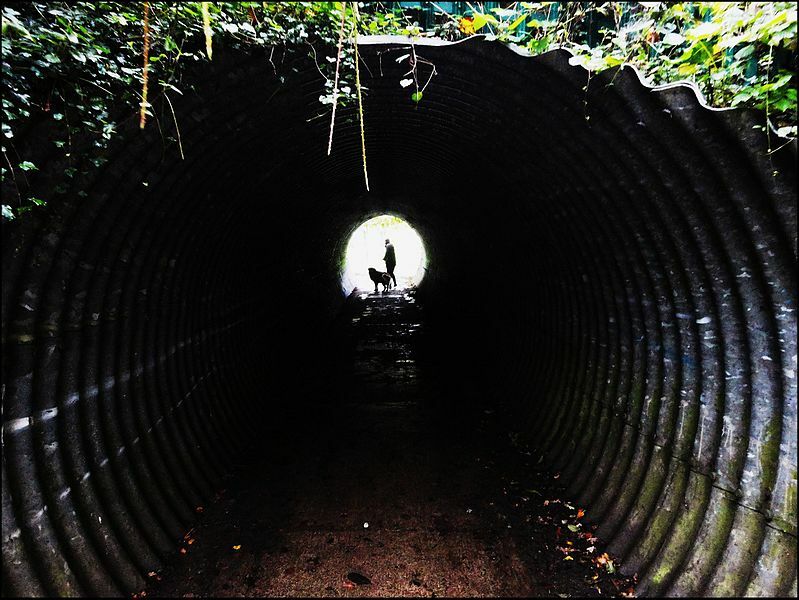 Description: SCP-4207 is a tunnel located at a cliffside of Rockingham Forest in Northhamptonshire, England. SCP-4207 cuts through a large wall of rocks and trees that make passage over SCP-4207 through the dense vegetation, difficult. This wall extends for SCP-4207 has a strong electromagnetic field that stretches for one mile that increases in intensity towards the center. All devices malfunction when used inside this radius. SCP-4207 exhibits temporal properties in the form of a closed loop. As subjects that observe the other end through the tunnel, they will see an entity that superficially resembles them. Depending on the choices exhibited, the individual on the other end of tunnel will always be seen going up the hill to the left with the observer following behind. Once the observer passes through the other end of SCP-4207, another person identical to the observer, will emerge from the left of SCP-4207 at the opposite end and experience what the original left off1. The individuals (designated SCP-4207-1) will continue to repeat this process ad infinitum unless outside interference prevents them from following their counterparts. 1. Of note is that the individuals experience a form of time dilation. From the perspective of the observer, the entities will have delayed reactions and appear to experience time slower than the observer.